Each year, A Better Answer participates in what is the most prominent answering service industry competition to determine a call center's overall quality of service. 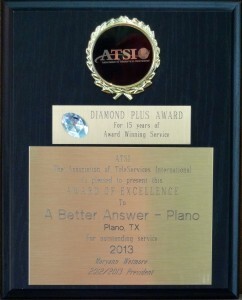 Winning the ATSI Award of Excellence is the best way to show just how great our answering service is, and winning the award for all three offices is just wonderful! For 2013, our Dallas office receives the award for the 15th year in a row, our Fort Worth office for the 10th year in a row, and our Houston office for the 11th year in a row. We are so excited and proud of all our answering staff and are happy to show proof that once again we are among the top answering service businesses in the industry!